Utter choke. I am surely allowed to use the choke label this time? Didn't even touch the hole. Shocking misread, that was basically Lyle's putt and always left to right. kwinigolfer wrote: Makes you wonder how we lost the Ryder Cup . . . . . . . .
You're an effing tosspot sometimes (well, most of the time), but how many golfers do you think have beaten these guys today? Come on kwini, 6 foot or so to win a major and you start it on the wrong side of the hole? At least we get to see a bit more of this. Genuinely surprised at Rose. Doesn't usually make mistakes like that. Bet he still holes the putt! I never believed Sergio could win The Masters, of all the Majors for me this was the least likely. He plays a fade and isn't a great putter, thats some achievement. Delighted for him. When you keep stiffing iron shots I guess your putting doesn't have to be that great. What a great tournament to watch. Not often is golf that exciting to watch. McLaren wrote: Utter choke. I am surely allowed to use the choke label this time? Wonder what he'll choose for the dinner next year?? Another stellar prediction there INW, how did you get on with the Grand National? JAS wrote: Wonder what he'll choose for the dinner next year?? Congrats to Sergio or something from a Harrington fan! I will never understand the adoration Garcia gets? What am I missing? Whatever you do don't admit that on here, half the board will hold you in contempt for ever more. Great final round by rose and sergio, course hardly being ripped up so both shooting 3 under in thise circumstances was very good. Glad sergio won though. Hes played every major since 1999, thats really impressive considering never had a winners exemption. A great career even if he didnt win, but now people cant hold it against him. A bit gutted for Rose as hope he would pull it off, but well done Garcia, he certainly had to win it. Outstanding back 9 and great viewing played with great sportsmanship. Well done to Sergio and Rose and also great kudos to the American fans who supported like they were both American players. I do wonder if this will be Garcia's Ivanisevic moment. Now he's got a Major, will his focus desert him and will he just be happy to have finally done it? PS. Was Mac crying into his 1997 Tiger Woods Annual last night about 00:45? Garcia could well rest on his laurels, but the 2 scenarios are very different. Garcia went into the Masters after a year of good form and ranked 11 in the world. Goran needed a wildcard just to play Wimbledon and basically had the fortnight of his life, I don't think anyone expected him to ever repeat it. I can see Garcia at least getting into contention in majors to come, whether he gets across the line or not who knows, it could well have gone the other way last night. Fine lines, as Westie knows. What i'd worry about, ( not worry, but you know what I mean) is that most players tend to stall after their first major win. OK, most of them haven't been in Sergio's class, but I do wonder if he might do a Willett, Clarke, Bradley, Simpson etc and stagnate a little. Hopefully it gives him the hunger for more, but wouldn't be surprised to see a lull in form from him for the rest of the year. I have no idea if he will win another, but I dont think he will fall away. He is only 37 and never really suffered with injuries. I was really surprised with how far he was hitting the ball, comfortably further than Rose on most holes. Who knows, he's about to get hitched so presumably is happy. Could get fat and lazy and enjoy spending his millions. Or he could be a Murray who clearly wants to win more and more. Time will tell I guess. Either way, he must feel the weight of the world has lifted from his shoulders. It was good to see how much class Rose had. He must have been gutted, but showed what a gentleman he is. Most amusing part of the presentation was when Hagestad the low AM looked bewildered at the suggestion that he might give up his NYC finance job and turn pro. You'd have to wonder why you wouldn't at least try and have a go at being pro if you're good enough to make the cut at Augusta. Could always go back to finance if you do a Bradley Neil and fail at golf. Sergio is too good to fade away. At the very least he'd resurface at the majors. Great win for Sergio, really happy for him. Yes, also feel a bit sorry for Rose but Sergios time had come. super_realist wrote: You'd have to wonder why you wouldn't at least try and have a go at being pro if you're good enough to make the cut at Augusta. Just shows that money are too good on Wall Street..
Thomas Pieters and Rahm seemed to have confirmed what we already knew. Next Ryder Cup could be shaping up for a belter. There must be some people who just see golf as a game and not a career, clearly it's not about the money for him. Would imagine the life of a pro golfer must be pretty tedious a lot of the time, though I can't imagine anything fuller than being a banker. I think this win might free Sergio up a little and he could go on to win a few more like Phil. Thought the shoot out between the two of them was great viewing. Fantastic Sergio. Let the snipers snipe - its all they're good for. Great event - not a major in my view, but I always enjoy it. Possibly even transcends major status, if only because of the way players feel about it, but limited field for one of the premier events has never sat easily. Let's get a proper set of majors around the world - works for tennis! Justin, pure class as ever, and great cameos from Charl and Kuchar. I reckon it's a pity Rory is now taking time off - get back on the horse! That was a great Masters, the most enjoyable for me in a while. The final pairing tied for the lead going up the 18th is exactly where you want them to be and the fact it was two golfers I like and want to see do well made it that extra bit special. Before you start I'm NOT a Sergio hater - very pleased for him .. just couldn't resist! Great last day's play. Thought Garcia had blown it with his drive on 13 and a couple of putts that seemed to be him doing what he had done so many times before, but his execution of shots down the stretch was phenomenal as was his composure, particularly having seen a 5 shot swing against him. Class reaction of Rose too in defeat. Bit of a shame Fowler and Spieth kind of dragged each other down in the same way that Rose and Garcia inspired each other, but happy with the way it went in the end. Don't like Rose's putting/aiming routine though. By the way, how awkward and eggy is the jacket presentation? Jim Nantz is woeful and Hootie Payne or whatever he is called is a cretin. Surely they could have a better way of presenting the jacket which isn't so shiversome? The jacket and the ceremony belong together, both appalling. super_realist wrote: Hootie Payne or whatever he is called is a cretin. Maybe on some issues but at least he dealt with the phone refs properly. 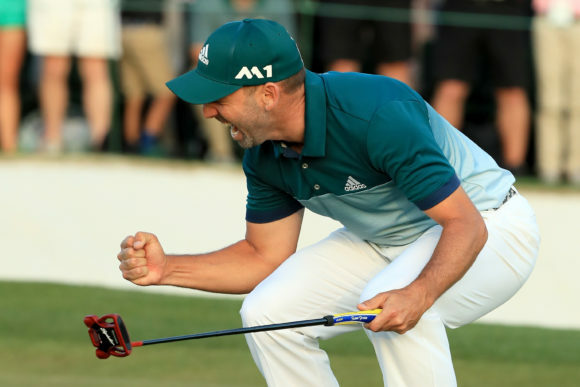 If this had been the US open I am pretty sure Sergio would have been informed somewhere up the final few holes that his ball had moved and he had been given a penalty. KFC for tea tonight Mac? Eyes on next years Dubai Desert Classic for an early indication of a Masters challenger. To be honest I did Google fried chicken joints in Edinburgh. Maybe one night this week. I will try and post photographic evidence. Really happy for Sergio, tbh I thought his time had passed. But he was exceptional. He finally displayed that mental fortitude that has robbed him many more majors. Johnson and Garcia both with the monkeys off their backs. Westwood's time should be next. Pieters definitely has earned a PGATour Card, should he want it. Fleetwood should have enough and Hatton, Fisher should have enough as soon as they make another cut on the PGATour. How do you like the taste of that humble pie Mac?